LARAMIE — In an otherwise dominant Rams season, Pine Bluffs quarterback and Big Horn kryptonite Haize Fornstrom twice led his team to last-minute victories. Fornstrom took a fourth-down carry into the end zone for an overtime touchdown, and a 2-point conversion a play later handed Big Horn its only loss of the regular season back in September. Saturday, he flipped into the end zone from 6 yards out with 43 seconds left to give the Hornets a 20-16 win in the 1A state championship. It took a miraculous Big Horn comeback in the fourth quarter to give the Rams the lead in the first place. Pine Bluffs had the ball, a 13-3 lead and a second-straight 1A title within reach. But Big Horn charged back. The Rams forced a fumble and took over at the Hornets 40-yard line. They steadily moved the ball but were halted and faced fourth down from the 11-yard line. But quarterback Quinn McCafferty had some fourth-down magic of his own, hitting Will Pelissier for a touchdown to bring the score within 3 points with 3:56 left. After the kickoff, Big Horn caused a Fornstrom fumble. The Rams recovered the ball deep inside Pine Bluffs territory, and on the next play, McCafferty found Carson Bates for a 25-yard touchdown. In the blink of an eye, Big Horn led 16-13 with 3:35 left. But that was more than enough time for Fornstrom and company. The quarterback did nearly everything, including returning the ensuing kickoff almost to midfield. He completed big throws and rushed the ball to move the chains. The Hornets strung together a nine-play, 52-yard drive. Eight of those plays featured Fornstrom rushes or passes. On the ninth play, the QB tucked it and ran from 6 yards out, flipping into the end zone to put Pine Bluffs on top again — this time for good. The Rams, with just 43 second remaining, moved the ball to the Hornets 35-yard line, but McCafferty’s final pass attempt fell flat, securing the championship for Pine Bluffs. 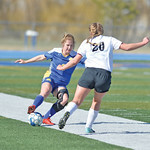 The game included several mistakes and missed chances for Big Horn. 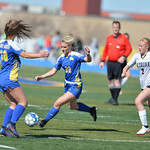 The Rams had two great scoring chances in the first half but only mustered 3 points. Pelissier nearly scored toward the end of the first quarter but was run down at the 3-yard line after a 48-yard gain. Big Horn had to settle for a 25-yard field goal from Jack Nance. Similarly, the Rams brilliantly set up a screen pass for Bates in the second quarter. He took it 33 yards down to the Hornets 2-yard line, but Pelissier fumbled two plays later. 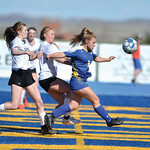 Despite the errors, Big Horn had just a 6-3 deficit ahead of itself as it looked toward halftime. But once again, Fornstrom showed his magic, scoring on a 60-yard weaving run as the half expired. He broke a tackle near the line of scrimmage, spun out of another one, cut all the way across the field and outran the Rams defense to the end zone. On their first drive in the second half, the Rams moved the ball down to the Pine Bluffs 29-yard line but faced another big fourth down. McCafferty looked for Bates down the sideline, but the pass didn’t land; the Hornets picked it off inside the red zone. After again moving the ball into the Hornets red zone, the Rams turned it over at the start of the fourth quarter, as well. On fourth and 7 from the Pine Bluffs 17, McCafferty faced heavy pressure and fumbled. Big Horn head coach Michael McGuire said he was proud of Big Horn’s effort, but noted that the team’s youth showed up too often. Pelissier and Bates, a sophomore and freshman, respectively, received the vast majority of carries due to starting running back Kade Eisele’s hip injury. Eisele played most of the game on defense and made a few plays on offense but was clearly limited. Standout receiver Kade VanDyken also missed most of the second half after apparently hurting his thigh on a catch in the third quarter. 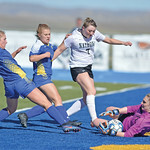 Overall, the Rams had a successful season, but McGuire noted the goal is never to just make it to the championship. The coach hopes his team will use the loss as fuel for next season. The Rams lose only one starting senior from this year’s runner-up team. Big Horn: Pelissier 21-113. Eisele 3-10. McCafferty 5-6. Bates 4-1. Pine Bluffs: Fornstrom 16-148. Steger 11-27. I. Martinez 11-25. K. Martinez 3-8. Scarborough 1-2. Big Horn: Bates 3-71. VanDyken 3-44. Pelissier 3-32. Michaud 2-17. Nance 2-17. Eisele 1-12. Pine Bluffs: DePaulitte 2-38. A. Fornstrom 2-27. Thurin 1-11. Golding 1-6. Tangeman 1-0.